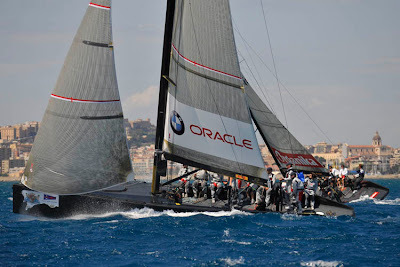 BMW ORACLE Racing wins match racing series at RC 44 Cagliari Cup. BMW ORACLE Racing today won the match racing series of the RC 44 Cagliari Cup finishing the round robin with an 8-1 record. In their first-ever match racing regatta together, BMW ORACLE Racing team owner Larry Ellison was at the helm with team skipper Russell Coutts calling tactics. The RC 44 Cagliari Cup began yesterday with a round robin for the highly-competitive 10-boat fleet. The two-day match racing series was sailed in strong, blustery Sardinia breezes, producing some incredibly close matches and exciting lead changes. BMW ORACLE Racing’s only loss of the nine-race round robin was a one-second delta at the finish. Six other BMW ORACLE Racing crew members were competing on two other entries and those two teams finished second and third in the match racing. 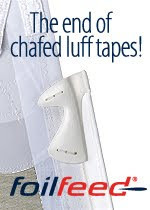 “Larry deserves the win; he sailed really well,” said BMW ORACLE Racing helmsman James Spithill who took second place honors helming Team Ceeref. Posting a 7-2 record for the series, Spithill had BMW ORACLE Racing crew members Michele Ivaldi and Joey Newton on board. The BMW ORACLE Racing team opened today with a win in their first match of the day against French match racer Sebastien Col. Ellison and crew led Team Hiroshi around the course. In the second race of the day against Mascalzone Latino, BMW ORACLE Racing posted another win following a textbook start where Ellison got the advantage and led around the course. Following a break in the action to allow the strong Sardinia breeze to moderate, it was the match of the day against double Olympic gold medalist and current Finn world champion Ben Ainslie, sailing with Patrick de Barros on Team ES Bankers Dubai. Ainslie, who has BMW ORACLE Racing crew Max Sirena, Noel Drennan and Daniel Fong on board, as well as sailing team coordinator Julien di Biase, led at the start. In a drag race upwind, BMW ORACLE Racing overtook at the bottom mark. Ellison extended the lead to finish 5-6 boat-lengths ahead of the de Barros crew who finished third overall with a 6-3 record. The RC 44 circuit is part of the BMW ORACLE Racing team’s overall 2008 sailing program. Other team members sailing with Ellison and Coutts were Dirk de Ridder, Ross Halcrow and Brad Webb. The fleet racing series of the regatta starts tomorrow and concludes on Sunday April 27.